by Bob Smith: WBA middleweight champion Gennady Golovkin (27-0, 24 KO’s) is fresh from a very impressive win over the brave but overmatched Matthew Macklin, but the question remains: where to go from here? Golovkin systematically dismantled, overwhelmed, and in the end dominated one of the best middleweights in the world in Matthew Macklin. Macklin is a peer of both Martinez and Felix Sturm and performed impressively against both of them. But against Golovkin he looked like an amateur. Dear reader, as I brief interlude, I would like to call to mind several recent articles by Bob Smith that pointed out the talent of Golovkin that I have written for this site over the past few months. 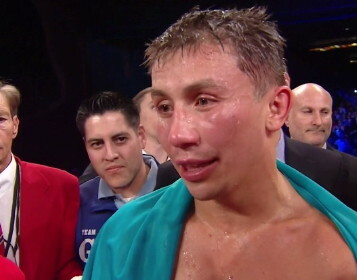 Golovkin is truly a very special fighter. Probably the best description of his occurred in a comment on this site were Golovkin was referred to as “the white Hagler.” In fact, Hagler himself is and was a Golovkin fan. Who will possibly dare to fight such a fighter? First, we can begin with something obvious: neither Mayweather nor Austin Trout nor any of the other top junior middleweights will get in the ring with Golovkin. Canelo is the exception, he would be willing to take the fight – then again, he comes into the ring at 170 for some fights, and he has a good bit of power for himself. Yet I just don’t see Golden Boy permitting that fight with Golovkin unless he gets a surprise KO win against Mayweather, and even then, it makes little sense for them to risk the perfect record of a superstar against an extremely dangerous fighter. Additionally, a fair point is that he is simply too big and strong for any 154 lb fighter, regardless of whether or not he can make this weight. Floyd Mayweather Jr. would be destroyed by Golovkin at 154, but it is not really a fair fight – Golovkin punches like a heavyweight – this is not my opinion but the opinion of those who spar with him (do a you tube search) whereas Mayweather started out his career at lightweight and rarely goes above 152 for fights. I view Mayweather as the greatest of his generation but Mayweather simply could not handle a Golovkin punch. In fact, Mayweather refused and refuses to fight Sergio Martinez, who is a natural junior middleweight, though if Martinez is severely weakened by his injury Mayweather might be willing to fight him then – this would be a great fight. (1) Fight the winner (or loser) of Barker vs. Geale. It is a fight that is realistic and Geale may be able to be more of a challenge for Golovkin than was Macklin. The more likely scenario is that both of them find excuses to avoid this fight. (2) Fight Peter Quillin or Julio Ceaser Chavez Jr. This is most likely the next major fight for Golovkin after some tune up bouts or bouts to stay busy. Kid Chocolate is a powerful puncher who has scored an amazing 10 knockdowns in his past two fights, and is also undefeated. Julio Ceaser Chavez Jr. meanwhile balloons up enormously in weight, has tremendous power, and has only one defeat to the very quick and agile Martinez. I see Golovkin fighting one or both of these fighters by this time next year and both would be exciting bouts. (3) Fight either Ward or Carl Froch. I think that in the end either Ward or Froch would be willing to fight Golovkin, mainly because both will underestimate him and be skeptical of whether or not his power can transfer to that division. I’m not sure if Golovkin has the maturity and skills to beat Ward, but I think that this would be the best fight for both the fans and the sport that could be made. Hopefully this fight is only about eighteen months away. Golovkin is an excellent fighter and the world seems to be waking up to this. In my opinion he would defeat anyone from 154 to 168 with the possible exceptions of Julio Caesar Chavez Jr. or Andre Ward. And the only reason I would question a victory against Julio Caesar Chavez Jr. is the tremendous weight advantage that Chavez would possess in the fight. But I think that his definitive victory last night showed that he would defeat any of the top junior middleweights – including Canelo, Pacquiao, Cotto Lara, Mayweather or Trout, provided that they fought him at 154, and additionally all of the regular-sized middleweights (all except Chavez Jr.). I am a Martinez fan and a prime Martinez could have really hurt and stunned Golovkin, and maybe even beat him, as he also did with Dzinziruk, but a slow Martinez with two recent knee surgeries should stay away from Golovkin for health reasons. At this point, I see Ward vs. Golovkin as a draw, with Andre making it a very ugly fight and being able to take away much of Golovkin’s power through controlling the distance and fighting tough on the inside. But I think Golovkin showed today that he has no peers at 154 and 160.